Return to Home > Pro-Gezondheid>Olimp - ALKAGEN - 120 caps. Olimp - ALKAGEN - 120 caps. 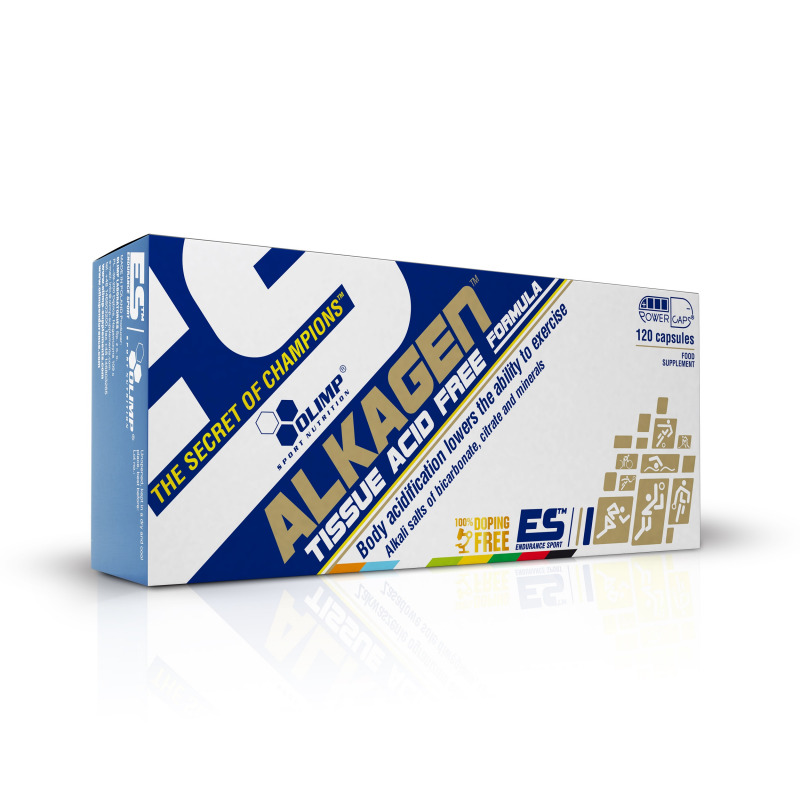 ALKAGEN™ – WIN THE BATTLE AGAINST MUSCLE SORENESS! During a strenuous physical workout, the production of lactic acid and other metabolites that reduce an athlete's capacity is particularly high. That is why a well composed supplementation should include high-quality products allowing a person to maintain effective aerobic and anaerobic energy production, and as a result developing well-functioning mechanisms preventing the disturbance of the acid-base homeostasis, and allowing for a more efficient workout and faster regeneration. It is a physiochemical state of the body, in which there is a more-or-less stable proportion between positively (H+ hydrogen cations) and negatively charged (OH- hydroxide anions) ions in the bodily fluids and cells, thus maintaining a physiological pH level of the systemic environment (7,35-7,45) that guarantees an undisturbed course of all metabolic processes. This balance is difficult to maintain especially during intense physical effort, when the lactic acid generated by muscle cells becomes a strong donor of H+ hydrogen cations. In such conditions, a muscle cell's ability to synthesize the basic energy carrier (ATP), crucial for muscle contraction (1), becomes limited. Recommended use: take 2 capsules twice daily between meals. Do not exceed the recommended daily dose. Food supplements should not be used as a substitute for a varied and balanced diet. A varied and balanced diet and a healthy lifestyle are recommended. Warning: The product should not be taken during pregnancy, breast feeding or hypersensitivity to any of the constituents of the preparation. Ingredients: sodium bicarbonate, potassium bicarbonate, calcium salt of orthophosphoric acid, potassium citrate, magnesium salt of citric acid, calcium salts of citric acid, magnesium oxide, bulking agent – microcrystalline cellulose, anti-caking agent – magnesium stearate, zinc bisglycinate (zinc amino acid chelate Albion®), capsule (gelatin, colour: E 171).